The 400th anniversary of the birth of Rembrandt is being marked at Amsterdam's Van Gogh Museum. For the first time an exhibition is being devoted to two of the greatest painters: Rembrandt van Rijn (1606-1669) and Michelangelo Merisi da Caravaggio (1571-1610). While the two artists never met, similarities are evident in their paintings such as their theatrical use of light and shade. Rembrandt studied Caravaggio's style with teacher Pieter Lastman, and all three painted The Sacrifice of Abraham. 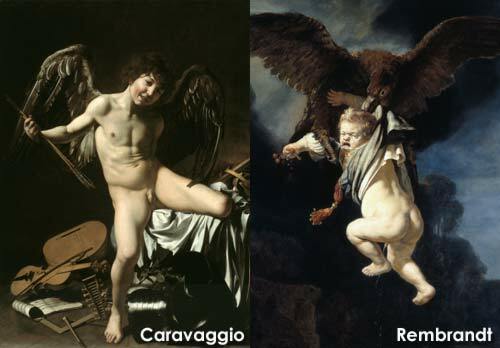 Caravaggio died four years after Rembrandt was born, but his works shows he learned much from his predecessor. The Rembrandt-Caravaggio exhibition runs from today to 18 June 2006. >> Click here to compare the paintings!